And so it begins once more. 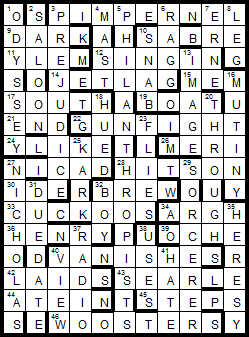 As I write this we’re already three puzzles in to 2015, and this is the first in a series of three fairly easy ones to start the year rolling. Perhaps, after all, the editors do want to show a bit of mercy, after a tough end to 2014 (especially the Sabre). Perhaps one or more of these will be in contention for the Gold Cup? Only time will tell. Roll on 2015, and our opener is Waterloo. Waterloo’s most recent offering came in 2013, with a delightful play on “Political Correctness”. Great fun at the time, and a quick glance at the preamble suggests a similar jokey-style puzzle awaits. Indeed, it wasn’t too hard, although I have to admit that there was more than a little back-solving of the various malapropisms, perhaps because I didn’t quite get Waterloo’s sense of humour. But never mind, as I did get to share the fun with my Mum, sat beside me as I solved this, and chuckling merrily at “The Midwich Cuckolds” or “The Lord of the Files”, among many others (oh, and “North and Southey”, which took us both ages…). Nothing too threatening, then, and an entertaining start to the year from Waterloo. How clever, too, of him and the editors to throw in a tribute to last week’s puzzle at 10ac! What awaits us in 2015, I wonder? This entry was posted on 23 January 2015 at 4:01 pm	and is filed under Solving Blogs. You can follow any responses to this entry through the RSS 2.0 feed. You can leave a response, or trackback from your own site.